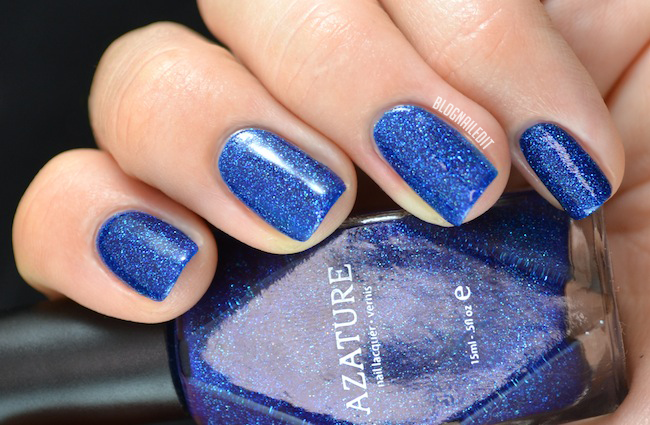 Azature, the creators of the most expensive nail polish in the world, have created a more affordable taste of luxury with polishes that each contain a real diamond in every bottle. Sorry...WHAT?! A diamond...in a polish...for $25?! I don't really know what else to say about it. To be honest, I thought the whole idea of polish with a diamond in it was a huge waste of money. The cost of the polishes is still outrageous in terms of polish. No one I know would pay $25 for a single bottle of polish. Who cares...they sparkle...can't you get that sparkle in less expensive, diamondless polishes? I'm not so sure you can. Even the thin yellow polish that took 5 coats to reach a decent opacity still sparkled higher than most other polish I own or have seen. So I suppose diamonds really do make the difference in sparklability. EDIT: I tweeted Azature to clear up my confusion below, and they confirmed: "There is a floating, fully-cut, and faceted black diamond". Now let me clear something up...I think. When I first saw these, I assumed that there were crushed up diamonds in the polish, but now that I think about it more, I think there's just a diamond floating around in the polish. This makes more sense, so I apologize for my stupidity. I'm right in my second assumption, right? I was lucky enough to be sent not one, but two Azature polishes: Azature Canary and Azature Blue. Azature Canary is a very yellow yellow. It's not masked by anything, and is truly just a bright yellow. Because of this, it's thin, and requires a lot of build up (5 coats here). I didn't really love that about the yellow, especially knowing it's $25 a pop for the bottle and you need to use a lot of it right off the bat. After it's all built up though it's wonderful, as I'm sure you'll agree. Azature Blue is more wonderful to me. It's royal blue and absolutely beautiful. Each speck of sparkle (whether it's chunks of diamond or just glitter) brings out the blue that much more, and I can't stop adjusting my hands to catch the light and the sparkle. I only needed 2 coats for this polish. Both polishes look better with a layer of top coat on them since they are slightly textured from the pieces of glitter...or diamond. I'm still not sure. I used Seche Vite, and no visible texture remained. 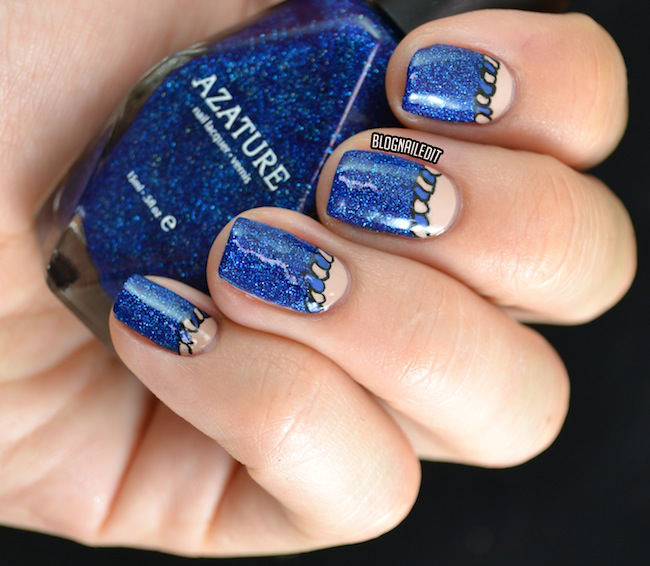 For the nail art, I used Azature Blue, essie's Mesmerized and OPI's Don't Pretzel My Buttons to make a fun rope outlining my half moon. Looking at these swatches again though, I'm not sure it needed nail art, because it really does sparkle. If you have the spare change, or are looking for a gift idea to give to your boyfriends, then consider this. Again, it's an outrageous amount to spend on polish, diamonds or not, but it is unique and may be worth the price. You can purchase Azature from their online store. These products were sent to me by Azature. The reviews are based entirely on my experience with the products and were in no way influenced by anyone. Yep, I definitely thought that there were crushed up diamonds in these too! The concept seems kind of pointless to me now that I know there's just a whole diamond floating around in there...but beautiful polishes regardless. :) That blue is gorgeous! Edited the post, but there is a floating diamond. I suppose their thought process is that you can pull the diamond out and have it, whereas your polish would eventually chip/be taken off, losing the crushed up diamonds. I reckon there's gotta be crushed up diamond in it somehow! Why wouldn't you just buy a normal diamond which would probably be slightly cheaper thant buying one that is sitting inside a polish bottle lol..
nonetheless these colours are so frikken amazing I would totally spend $25 for them! Cleared it up with them and edited the post. There is indeed a floating diamond. I'm no jeweler, but I think a diamond would cost more than $25, so maybe you're getting a better deal...once you wash the polish off. P.s can you please show us what the 1 coat of the yellow looks like layered over a black or dark colour? Hmmm... I agree more with your first assumption, crushed diamonds. Why would anyone want a diamond floating in polish? But now that you point it out, I just don't know. The whole concept seems very Louis XIV to me. The blue is gorgeous though, it sparkles like crazy, and two coats is perfect! It's a floating diamond (edited the post now to clear it up after tweeting with Azature). Maybe diamonds aren't susceptible to acetone, so once you fish it out and soak it in acetone, you get a shiny diamond to do with it what you will. Not just a waste of money, it's a waste of diamond. But they do look so, so pretty *_* ! I do love a good yellow sparkle, yes I do. OMG. 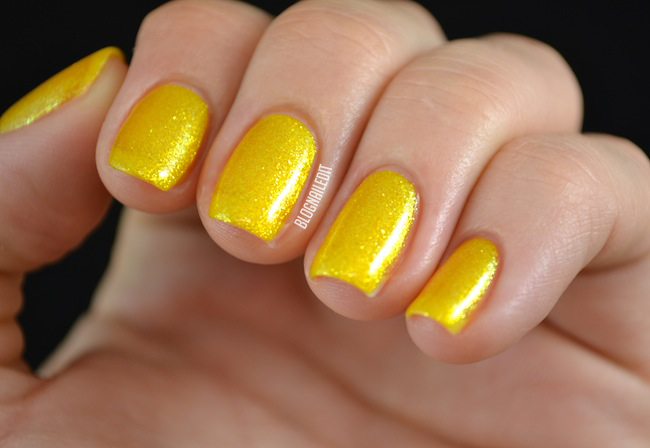 That yellow polish is just perfect! So beautiful shades! I Love your nail art! They're pretty, but not $25 pretty. Do they use the diamond like a mixing bead? That's my guess, but I'm really not sure. They probably have proper mixing beads as well, but I guess I'll have to wait till I use the whole bottle to find out. I love the yellow nail polish!!! That's a ridiculous price...diamonds or no. Black diamonds are cheap so if I was to venture a guess, the (probably) 1/8 carat black diamond is less than $10. Black diamonds are also more porous so I'm assuming that it would be permanently marred by the polish. At any rate, the colours are pretty but nothing special to me. I'd rather buy half a dozen Wet n Wild than spend a small fortune on one of these. I love that shimmery yellow! 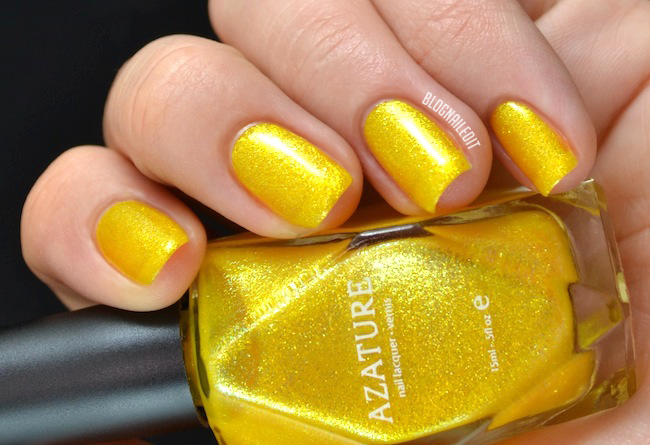 I love the color of Azature Canary, however, I think 5 coats is too much? Is it? Has anyone ever finished a bottle to see the diamond?